The Preserve at Oak Meadows Raises the Bar as a Course for the Community — and the Environment, Too. ADDISON, Illinois — It’s faced fire over the years, and it’s faced more than a few floods, too. It’s been a victim of old age, outdated and outpaced by a game grown more sophisticated as the years went by. By most accounts, you see, ol’ Oak Meadows had seen better days. But the past, as they say, is prologue. And today, after careful planning, big ideas and a multi-million budget, the rebuilt, reborn, and renamed Preserve at Oak Meadows is living proof, in so many ways, that it’s never too late to be all you hope to be. It’s an unseasonably warm, sunny fall day, the kind of bright, late-season Saturday that’s such irresistible catnip for golfers everywhere. It’s a good day to end up in Addison, a (somewhat) slower-paced suburb in Chicago’s southwest – ern side, to get a sneak peek at the new Preserve at Oak Meadows. Pulling in to the parking lot, all that’s missing is a stately clubhouse towering past the putting green, temporarily replaced by a food and beverage trailer and a modest makeshift clubhouse. It’s a reminder of the disastrous 2009 fire that gave the Dupage County Forest Preserve a little pause, and gave it time to start thinking about the bigger picture for Oak Meadows. It’s also a reminder of the beginning for Austin Kopp, the Preserve’s clean-cut, mild-mannered head professional, who started his career at the club not long before the fire. 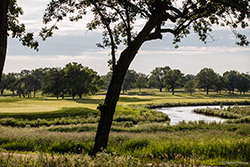 The old Oak Meadows was built in the 1920s as private Elmhurst Country Club, and it enjoyed moments of glory over the years, including Ben Hogan’s incredible Chicago Open victory in 1941. 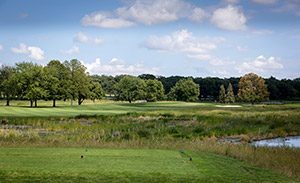 But the private club slowly slipped into obsolescence, and was eventually bought by the DuPage County Forest Preserve District in 1985, renamed Oak Meadows Golf Club and opened to the public. Like many of its peers in the Chicago area, the parkland layout was heavily treed and lightly bunkered, and the busy muni was a favorite among the locals, who teasingly called it, “Soak Meadows,” due to the frequent flooding of Salt Creek, which ran through its heart. Efforts to control the flooding ended up making matters worse, creating waterlogged fairways for days at a time. So following the fire, the Dupage Forest Preserve found it time to rethink the property entirely. 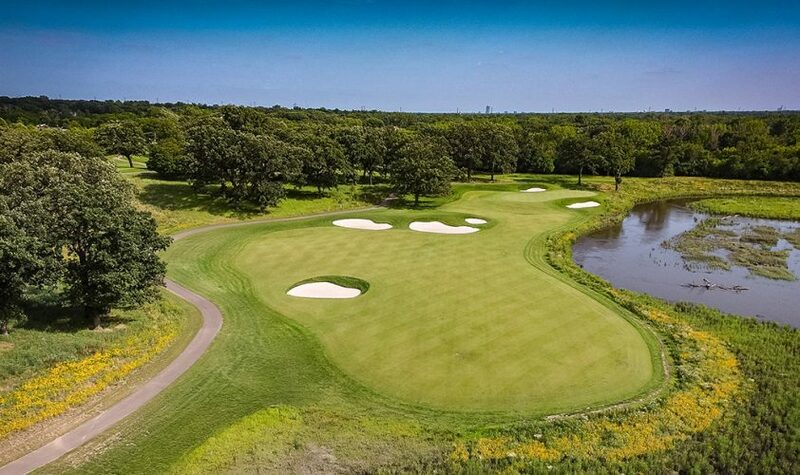 They also found the money, to the tune of $17 million, to turn the old Oak Meadows and its nine-hole Maple Meadows East course into a singular showpiece for the community. They hired Chicago-area architect Greg Martin to handle the remodel, and tasked him with working with the environment, not against it. If Oak Meadows had learned anything over the years, it’s that if you can’t beat Mother Nature, you’d better join her. So they did. Martin and his team consulted with drainage experts, hydrologists, the Army Corps of Engineers, and even the Sierra Club to come up with a viable plan for the 288 acres. The answer they found was to give the Salt Creek a wide berth during the rainy season, removing 1,500 trees, and planting and building in 35 acres of new wetlands along the way. 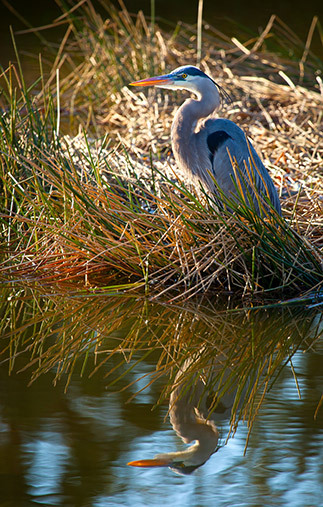 The Preserve is home to a variety of birds, including the great blue heron. All of that took time, however, and the facility shut down for two years from July of 2015 until it reopened for “preview play” late last year, before its grand opening this spring. “Our ‘preview’ season went well, by all measures a success,” Kopp said. 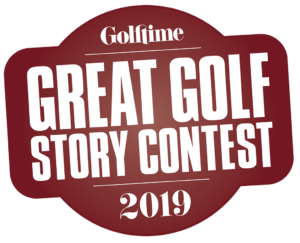 “We had a good problem to have — more golfers than we had tee times available, even on the weekdays. We had a lot of repeat customers coming back to us, but we had a lot of new visitors, too, so it was really cool to see. “It’s lived up to our expectations and exceeded them in a lot of ways, too. We were waiting for that first big flood event and sort of, put the tires to the pavement, so to speak, and really make sure it meets the test. We got tested in the spring and in July, and we got floods that would’ve closed the old Oak Meadows for a week or more and done damage. And it didn’t impact the playing surfaces really at all. It’s cool to see it do what it’s designed to do. But all of that would be for naught if the course didn’t live up to the expectations of the golfers, too. But fear not; Martin’s work blends the old with the new beautifully, preserving its past legacy on a championship track built for the modern era. “It’s fun to see a lot of the old course mixed in with the new course, but it’s truly a brand-new course and a better product,” Kopp explained. “Better irrigation, better bunkers and materials, better grasses. 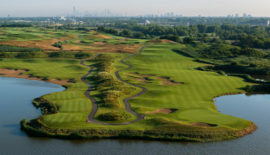 I was paired with two golf-crazy Chicago natives, John Searles and Pat D’Amico, who fondly remembered the former “Soak Meadows.” Both marveled at The Preserve’s new condition and character, and put the new club on par with some of Chicago’s best public offerings. We played from just under 6,700 yards, a bit out of my comfort zone on a typical day, though a clip I found surprisingly playable. The Preserve, as it turns out, puts a premium on strategy, not just strength. “It’s a mix of forced carries, but we try to get people to the right tees so those forced carries aren’t so much in some areas,” Kopp said. “Hole 11 (a 435-yard par 4) is a good example of that, hole 16 (a fantastic, 355-yard par 4) is good example of that. There’s room to put the ball in play, but you’ve got to hit it to the right area. The tough-but-terrific 223-yard, par-3 10th hole. 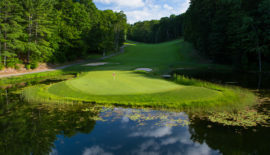 The Preserve’s front nine preserved the parkland feel of the old Oak Meadows and Maple Meadows, while the back winds its way through reclaimed wetlands, pushing you to play over and around the Salt Creek. The toughest par 4 on the course, the Preserve’s 461-yard ninth flirts with the Salt Creek throughout. 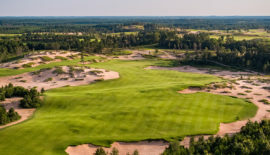 From front to back, The Preserve is a powerful new addition to the Midwest’s public golf scene, one that’ll leave you high, dry — and anxious to come back for more. 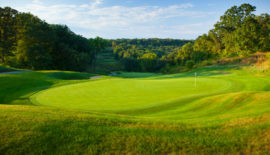 Please visit www.dupagegolf.com for more information.